Few if any had heard of Scelsi until the Cologne ISCM in 1987, a year before his death. He did not publicise himself, refused to allow photographs and was so successful in self-effacement that most works of reference ignored his existence. He was born in Italy. On his mother�s side he had Spanish aristocratic blood. He studied with a pupil of Schoenberg in Vienna and was writing 12-tone music long before his countryman Dallapiccola. He found the strictures of dodecaphony and of strict serialism a dead-end. His métier was influenced by a pupil of Scriabin whom he met in Geneva. Oriental spirituality and musical method shaped his music. This is a uniquely valuable set reflecting friendship and great dedication. Aion (describing a day in the life of Brahma) tumble and growl in protest. It suggest primeval activity in profound depths. Some of the brass protests recall Hovhaness's dissonant Vishnu Symphony as well as Pettersson's groaning trombones melded with the stygian tensions of Griffes� Pleasure Dome. The orchestra is made up overwhelmingly of brass instruments. This accounts for the predominance of a certain gruff reverence. Pfhat omits oboes and violins, the choir intones, sighs and wails in whispered awe. Horns and brass rumble and roll in a stasis of mystery. All this prepares us for the second section in which the skies open explosively. A celesta-inaugurated blessing makes way for a dazzle of tinkling bells. Konx is in three movements unlike the four movement Aion and Pfhat. The title combines the words for peace from old Assyrian, Sanskrit and Latin. The sense of something static is instinct in this work; a sense of being ushered into arcana. The central movement opens a trapdoor into heaving chaos - a hellish turmoil of flailing bodies. The final section has dark noises from the choir like the growling intimations of eternity to be heard in some of John Cage's works for solo instrument. The Quattro Pezzi are each on a single note. Unusually this is the one work of Scelsi�s that achieved fame overnight following its premiere in Paris in 1959. There it was conducted by Maurice Le Roux with the National Orchestra. There are 26 musicians specificed in this score only five of whom are string players. There is plentiful percussion and brass but they are used with fastidious craft. Scelsi�s stillness and sequestered mysteries are not about complexity or elaboration or about obvious melodic material. Anahit is the Egyptian name for Venus. The work is played here by Carmen Fournier but was premiere by Devy Erlih (a wonderful champion of the Tomasi violin concerto - a world away from Scelsi). Once again this is a static piece. It is in a single continuous movement in which ancient evenings in Thebes are fearfully evoked. There is a wailing dissonance to this music and a great thrumming of activity, a slow turning and writhing and a swaying and slaloming crawling and swinging, This ends as the violin reaches out and grasps G and holds it amid an understated ambivalence of harmonics. The five movement Uaxuctum is for ondes martenot and orchestra with chorus (chorus is a part of all these pieces used as another �colouristic� stratum). Here there are awed sighs, sharp exhalations and stratospheric quiet notes as well as great plate tectonic movements. Ligeti-like waves of choral sound sweep through the fourth section. By the way Uaxuctum is a reference to the name of the Mayan city destroyed by the Mayas for religious reasons. This score occupies very much the same territory as Alan Hovhaness at least conceptually though Scelsi writes in a somewhat tougher style: a case perhaps of Ligeti meets Debussy's Images. The piece was premiered in Cologne under the baton of Hans Zender. Hurqualia was the first of his orchestral works. As ever the high strings are left out and the brass predominate without turning in anything remotely like a brass band sound. This is much more demonstrative than many of the pieces. Its effect is Oriental rather like the strange sounds produced by Avet Terteryan in his Third Symphony crossed with pecking rhythms sometimes similar to Beethoven's Fifth. This is slow rolling gnarled and enigmatic but with more intimations of melody than in any of the other works. Hymnos is the duration of a concert overture. It is the longest unbroken span of music that he composed. There is no chorus this time. The score uses the single largest orchestra he ever specified - 86 musicians. All the strings are used this time uniquely among Scelsi's works. It is once again predominantly slow. Slow motion wailing changes writhe in an expressive torment. Chukrum dates from the same time (1963-4) as the third and fourth string quartets. It is written for a very large string orchestra often divisi in fifteen parts. Here is the work of a composer who wrote concisely and offered glimpses, indeed long unblinking gazes, into mysteries and into oblivion. The string writing is bustlingly and buzzingly complex; try tr. 7 where Penderecki was surely an influence. The music rises to extraordinary heights in tr. 8. The finale and the central two movements are instinct with heaving turmoil. 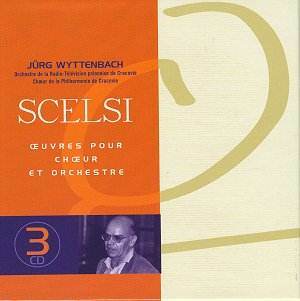 These are world premiere recordings directed by the composer's friend, Jürg Wyttenbach and set down within a couple of years of Scelsi's death. The notes are by Harry Halbreich and, as usual from this writer, are lucid and informative. All in all this is a very recommendable and deeply rewarding box in which static sphinx-like arcana stare at us and challenge us to understand. There are moments like this in Havergal Brian - say in the Eighth Symphony and The Gothic - but those moments are here extended, sustained and unhesitant. The CDs are of LP-style duration. Remarkable music, static, mysterious, Ligeti-like and with a rare sense of arcane things ... of otherworldly events. There is little sense of structure in a conventional sense. These pieces are each like a stele or a monolith. Scelsi spends his creative currency in awe and strangeness.